Are you are talkative person? Like the person who seems to be able to spark an engaging conversation on the train with a complete stranger on a Monday morning and end it seamlessly? If you are, jeez I envy you. I am not sure if it was because of higher than normal shyness as a child, or my environment (I was always told to keep quite as child; school, tutoring, home etc. ); I struggle a lot with conversations. The problem is not starting one but the middle and ending are the place for were my most embarrassing moments come from. Just this week, I went to my university tutorial. In my panic stricken state, namely because I had no gasp on the concept for this sociology topic, I blurted out the most random comment when the teacher asked me a question. This not only led to a heated debate but the worst part is I was caught in the middle of it. I think a few of the students in the class hate me now. Oh well… at least I will never have to see them again after this year. Serious question. How do you keep on topic? I cannot help feel awkward if there is a silence of longer than two seconds. This of course leads to inevitable sweaty palms, shaking and stuttering. Worst of all these is the awkward silence leads me to waffle on about the dumbest things. I am probably doing it right now on this blog! Waffling about waffling! Can you think of more jumbled set of topics? Maybe you can beat it? Now for very relevant recipe for this post is WAFFLES!! You can see how excited I am to actually get a REAL waffle maker, like good quality one not the cheapie from the two dollar store. 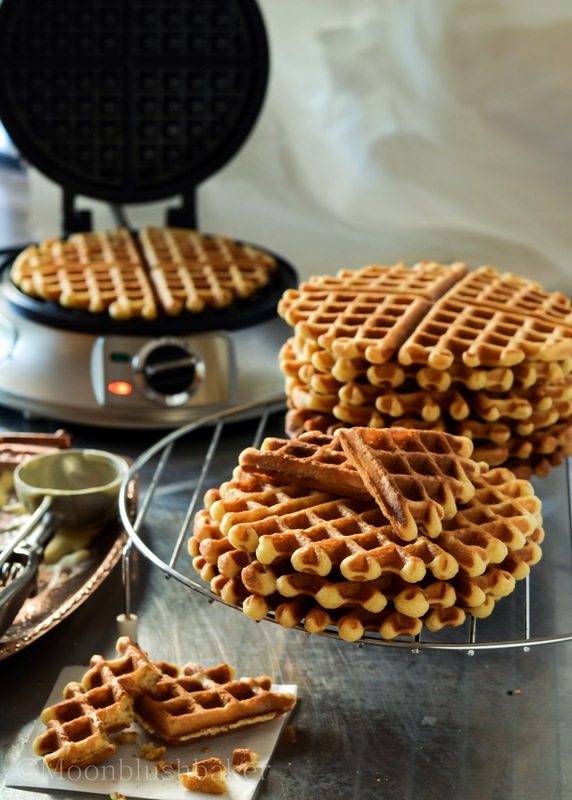 If you live in Australia, the difficulty of obtaining a Belgium waffle maker is on par with seeing the loch ness monster. Hundreds of fake ones but never the original. Of course this purchase is totally out of necessity; at least that is what I keep telling myself. You guys in USA are so lucky to have such a big waffle culture over there. 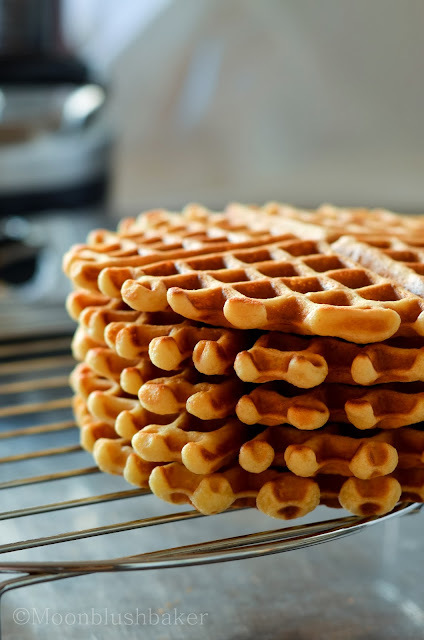 I love waffles; it is on par with bread as one the greatest carbohydrates ever. They are so adaptable; sweet or savoury it is the quickest way to carb heaven in my books. Also who has had a day when all they ate was waffles? I have! Sweet berry waffle for breakfast, waffle cheese sandwich for lunch and a waffle as a sub for bread in soup. Really you should try to do this even if you are not a waffle addict; it bound to turn you into one. I have only had this waffle maker for about a month and I think I used it every week to date. Serious. I have yet to try this tofu waffle on iamfoodblog, but you can be sure I am looking forward to it when I do. 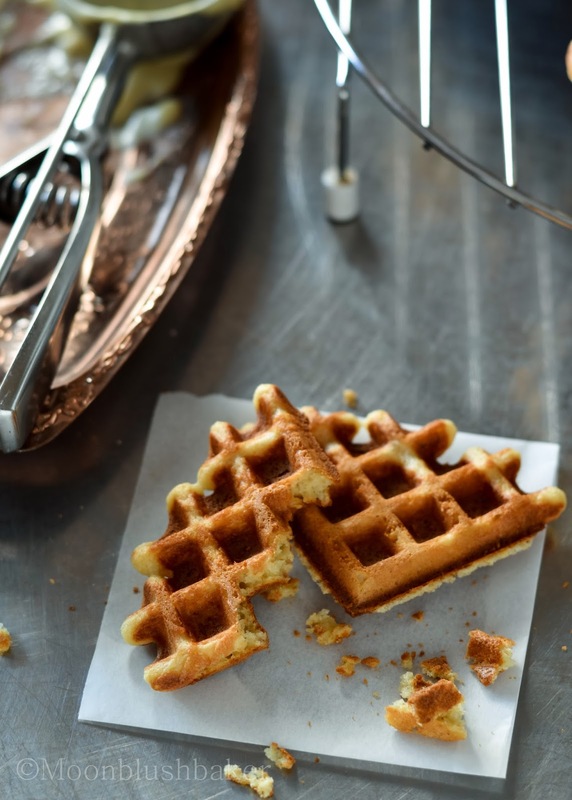 Now these are yeasted waffles which make for an addictive start, but are made more so with the glorious addition of burnt or browned butter. We all know about the greatness brown butter imparts on any food stuff it touches; add a well-known and trusted recipe and you got a winner. While I have no idea who Fannie Merritt Farmer is. I know she is writer of a The Boston Cooking school cook book and creator for this recipe. Either way I hope these photographs can do her proud because these are everything you can hope for in a waffle. Buttery? Check Malty? Check Crispy edged? Check Fluffy interior? Two checks. So good you do not even need syrup! I am going to stop gushing and link you to the recipe. I used the measurements from smitten kitchen. So I have only changed the wording of the steps and the addition of brown butter in place of normal melted butter. The night before: Combined warm water and yeast in a large 5 litre bowl.Whisk in milk, butter, salt, sugar and flour.Cover bowl with cling film. Leave over night on the counter to proof. Next day; whisk in eggs and baking soda until smooth. 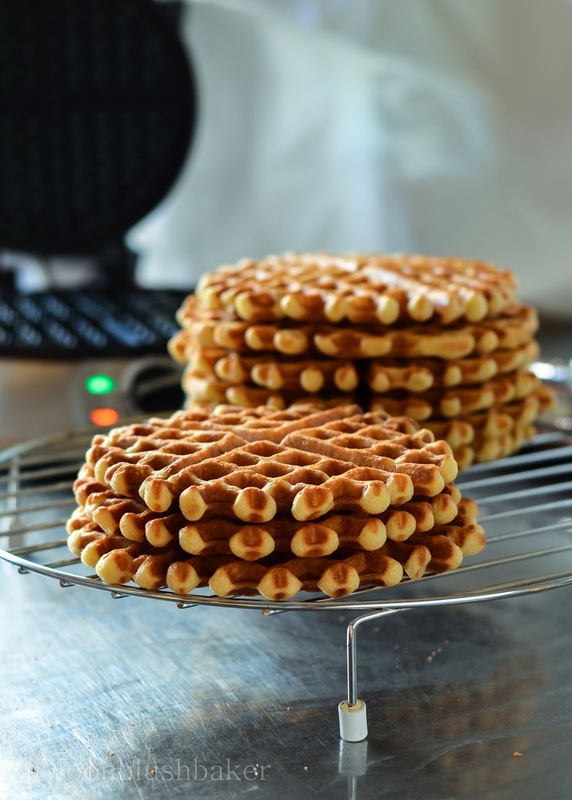 Heat waffle iron. Using an ice cream scoop, spoon one and bit (1.5) scoops into the waffle marker. Cook to manufacture instructions, mine went for 6 minutes. Repeat with remaining batter. You had me at brown butter! I’m obsessed and waffles are the perfect use for it. Thank you Laura. the best thing to happen to butter is burning it! you and me have so much in common Cheryl. Wanna be Brown butter buddies? Life happens nami, It is so sad sometimes. I am sure your kids will love this, my little cousin did! Smiles all around. I would love to have you in my kitchen, maybe you can help me with my savoury cooking eh? Dude, I need to get a waffle maker now! You do not have one!?!? 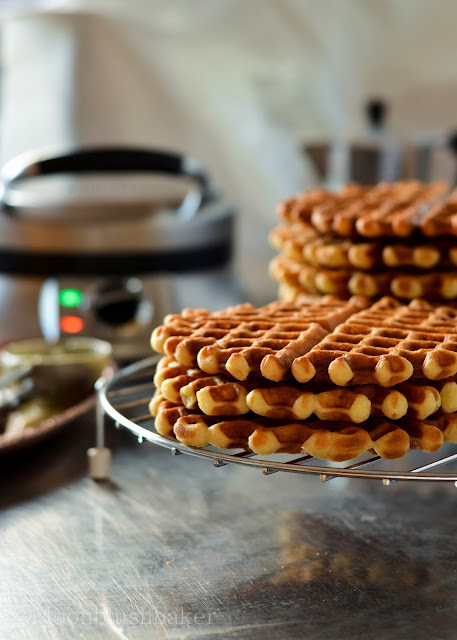 Oh chung I want to send you one right now, so you can make these waffles! This is the first time I have seen liquid measurements given in weight. Seems odd….. The reason why I use gram measurements for liquid is that when I make bread or work with yeast it is more actuate and produces more constant results than cups, tsp and ml. However 1 gram equal 1 liquid ml in Australia conversions. 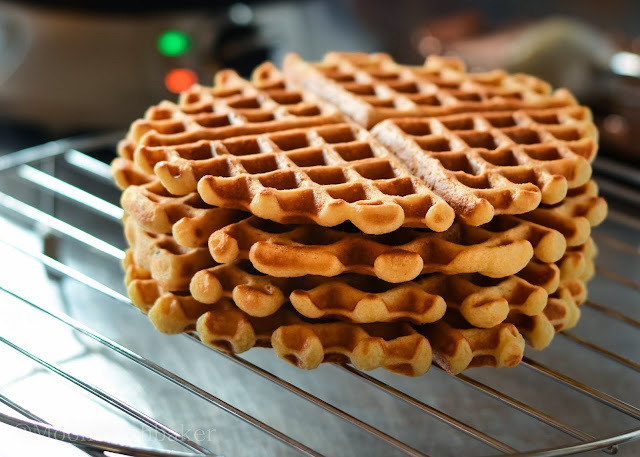 Pretty sure I’m going to have to whip up a batch of these waffles this morning! Thanks for linking up with What’s Cookin’ Wednesday!